While the K70 was officially Volkswagen's first FWD car, today's Nice Price or Crack Pipe '73 presently has its engine in the rear. You'll of course need to decide if that makes its price something not worth getting behind. Back in the '80s Joe Isuzu hawked his eponymous car maker's wares by lying. There was no fibbing yesterday however, as our supercharged 2001 VehiCROSS dropped in a narrow as a hipster's pants 53% Crack Pipe loss. It was just considered too pricey for something that represented the unknowns of someone else's custom work. Hopefully you'll be far more comfortable with your own work because, while far cheaper than that Isuzu, today's Toronto-located 1973 Volkswagen K70 comes with some assembly required. The K70 was Volkswagen's first car that featured not just a water-cooled engine, but also front wheel drive. The thing of it is though, it wasn't really a Volkswagen. In fact, the mid-sized sedan was wholly developed, and had been planned to be sold, by NSU. Founded during Germany's industrial revolution, and named for the sewing and knitting machines the company first made, Neckersulm-based NSU is probably best known as the first company in the world to offer a wankel engine in a passenger car. That rear engined Sport Prinz led the way to the Ro 80, an aerodynamic front-drive sedan with a longitudinally-placed 115-horse edition of the company's two-rotor. Unfortunately, the cost of developing the rotary engine, its eventual lack of reliability, and lack of licensing revenues when almost no one else would get on the Wankel bus, sent the company into financial crisis. It's eventual savior would be Volkswagen AG. The K70 was developed along the same lines as the Ro 80, and in fact if you squint a little you can see the relationship in the car's greenhouse and shadow lines. Also like the Ro 80 it too had its engine situated north-south ahead of a transaxle. That mill was a 1,605-cc inline four that produced 74-bhp. A four-speed manual was offered as standard equipment, as were inboard front disc brakes, rack and pinion steering, and a MacPherson Strut front suspension. Volkswagen bought NSU in 1969, integrating them with Auto Union to create Audi, and one of the first things they did was to prise off all the former brand's badges, replacing them with the familiar VW trademark. Overall, K70 production topped a modest 211,000 or there about, before the car was replaced by the Passat/Audi 80. Do you know how many of those K70s VW shipped to America? None, that's how many. That's right, zilch, zero, the big goose egg. There are a couple of the cars floating around here, but man they are rarer than a Rabbi eating bacon after sunset on the sabbath. This one is said to have been originally purchased in England by the seller's father (hence it's being right-hand drive), and then shipped to Canada back in 1990. It was then somehow packed away for a few years, and sadly, upon its reemergence it had not transformed into a beautiful butterfly. Instead, the engine - which is likely the 100-horse 1807-cc edition introduced this model year - had locked up and apparently lacking that cure-all known as Marvel Mystery Oil, the owners decided to tear it down rather than free it up. The mill now resides in the boot, and the space up front where it should be has a whole lotta' empty goin' on. Rebuilding a 40-year old NSU-sourced VW engine may sound like a fool's errand, but it can be done, you just have to have faith, ingenuity, and the Internet. The rust exhibited on the body also looks pretty easily repairable, and the structure seems sound, or at least it's not obviously collapsing under its own weight. Most of the trim and interior bits - which also would be hard to source these days - appear to be intact, aside from some number rub strips. Also, it has a vinyl roof, and who doesn't love those? Getting this car back on the road will be a daunting task, but imagine the bugged eyes and envy-thinned lips that would result from rolling into a Waterfest or other VW show behind its wheel. The initial cost of entry for that experience is $2,000 Canadian. Now, you could aver that it would be cheaper to buy a running K70 over in Europe and bring it back over here, but honestly I don't think there are that many left over there either. Of course, that's the point of NPOCP, to debate the appropriateness of an offered car or truck's price, and here now is your chance to do just that for this rare Volkswagen. 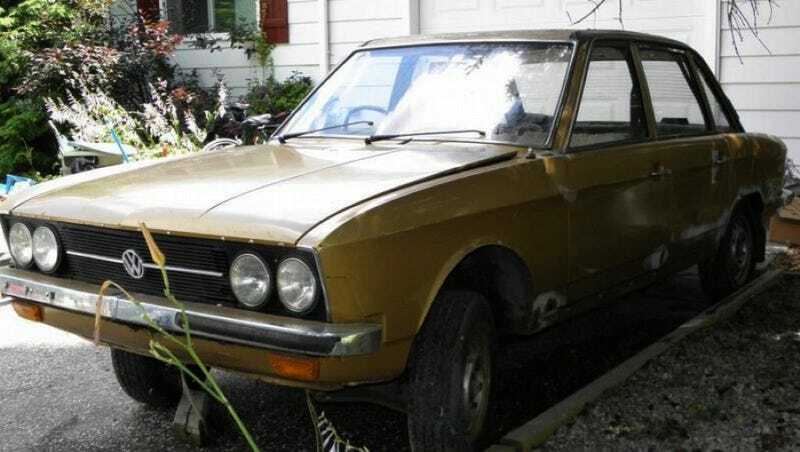 What do you think of $2,000 for this once upon an NSU? Is that fair, or does this adopted VW's price not foster much enthusiasm? Toronto Kijiji, or go here if the ad disappears. H/T to Kieran Whalen-Hughes for the Canadian goose!